Nature has equipped all animals with the physical assets required for their environment. Good eyesight is a subjective term in this regard. While rats certainly do not possess the razor sharp vision of a bird of prey, their eyesight is more than sufficient for the day-to-day tasks they need to achieve. Rats see in color. They have two types of color cones in the retina; one for detecting blue ultraviolet light and one for detecting shades of green. Their color detection is similar to that of humans, but rats are red-green colorblind, meaning they perceive most shades of red as a generic dark shade. Where rats fall short of humans in vision comparison is on clarity. The size and number of cones, which detect light, in the rat’s eyes means that while they can discern different colors, they see much of the world as a blur. Their ability to detect contrast between colors is weak, but since they are primarily nocturnal, this is not an important adaptation for them anyway. Their eyes do have an excellent response to brightness, however. In fact, rats are typically light averse. One thing rats can do that humans can’t is detect ultraviolet light. This is important for the rat, who spends much of his waking time in darkness. Ultraviolet detection enables rats to see the urine marks of other rats. This ability also enables them to see better during twilight hours. Unless an animal has extremely large eyes, like a bird of prey, or multiple eyes, they typically have to sacrifice either their field of vision or depth perception. Animals with eyes on the side of their head have an almost 180-degree range of perception, but poor depth perception. Animals with eyes on the front, such as humans, have good binocular vision and therefore strong depth perception, but a slimmer range of perception. However, rats compensate for their poor depth perception using a technique called motion parallax. By bobbing their heads up and down, they are able to take multiple mental photographs of the field of vision in front of them and the brain then calculates an approximate depth. Rats are capable of moving each eye independently. A rat’s eyes are positioned on the side of the head, enabling him to take in the view from the periphery. Like humans, rats have a blind spot in the center of their vision field. Both human and rat brains compensate for this by piecing together the information from each eye and filling in the blanks. 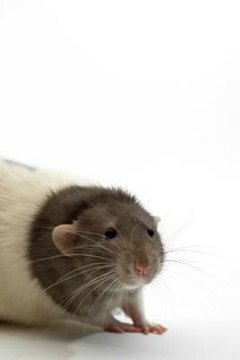 However, rats can expand their field of vision in a way humans can’t, by moving each eye in a different direction, enabling them to literally keep one eye on the sky. This is most likely an evolutionary adaptation that enables rats to be vigilant to aerial threats from birds of prey. Rat Behavior: What do Rats See? Do Rats Have Poor Vision?